It is our goal to produce only top quality clivias for the discerning clivia enthusiast. We are constantly busy pollinating and cross pollinating a variety of clivias. Pollination is done by hand from select pollen on select parent plants. Our plants have been selected for quality of colour, size and beauty, size of umbel and quality of foliage. Pollination is done by hand from select pollen on select parent plants. Our achievements in the early years was made possible by obtaining the best stock we could obtain from some of the best breeders out there, by doing this we bough time and this had made it possible to start producing high quality plant in a short time span. I would now like to make use of this platform to thank all these breeders for the help and support I was given when starting this hobby, these breeders will know whom they are when reading this, thank you once again. 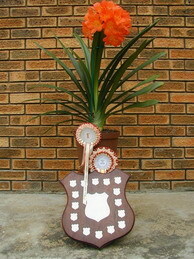 Our plants have won some top awards at major clivia shows and photos of some of our plants can also be seen in the Photo Album. Some of these plant are our own, and some of them are stock that was bought as breeding stock. If you would like to be placed on our mailing list to receive information about the availability of seed, seedlings, offset and flowering size plants please follow this link and complete the registration form. I hope you will enjoy viewing this website, and please feel free to contact us for any information regarding clivia on this website.